The hype is starting to build for Resident Evil: Revelations, not surprising as it's the first major release of the year on 3DS. With that in mind, it seems that Capcom is ready to go the extra mile to give fans of the series all of the content they need to get them excited. 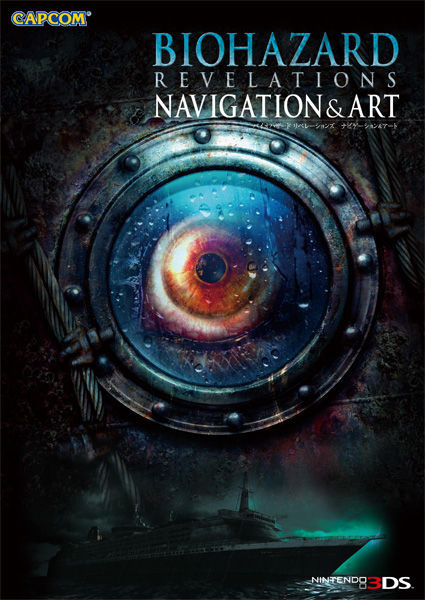 According to Andriasang, Capcom has announced a rather attractive 'Navigation and Art' book — or strategy guide if you prefer — that will release alongside the game, containing 192 pages of tips, maps and concept art. A two-CD soundtrack is also due to be released just under a month after the game, featuring 66 tracks: the first print run will also include a third disc with the Resident Evil: The Mercenaries 3D soundtrack and a limited edition sleeve. It all sounds good, but unfortunately these are currently only confirmed for Japan. It's possible that one or both of these add-ons may make it to the West, so do you think you would pick them up? I thought these were pre order bonuses at first. Almost made me want to make a decision on RE. Could care less if these make it here or not. I'm not wasting big bucks to buy these when the internet already has them. The only thing I want is the game, nothing else. game sountracks never did anything for me. I can hardly imagine (at any age) explaining to someone walking in "weird, what's that music you're listening to?" , "oh, it's just the soundtrack to final fantasy 54." I'd like to think I have a shred of dignity left somewhere in me. For a good price i guess i'd get a special edition with the game, art-book, soundtrack and the CCP. Since that won't happen i first have to see if i love the game enough to warrant a buy of the soundtrack. I'd not be willing to pay more than for a regular audio CD here anyway. The artbook even has a tougher stand since the main characters are quite stereotypical / not very imaginative or cleverly designed to me. I'd get it anyway. It would be awsome!!! I'd get it cheap on eBay if it ever shows up their. RE Historia and Resident Evil 16th Anniversary Symphony. Isn't this the game that Capcom wants to charge $50 for, not counting the Circle Pad Pro? I just don't wanna imagine how much it would be worth with those extra things. It would be cool to get those things in north america but seeing as how Capcom snubbed us on the 15th anniversary collection. I won't be holding my breath. And the CD is no slouch either. If this is included in the non-Amazon $49.99 price point (and if it comes to NA ) then it definitely justifies the extra ten bucks imo. Awesome. Edit: Oh, actually re-reading it, it sounds like it'll have to be purchased seperately, not included with the game, lol. @ Ren - Wiz Khalifa - Never Been is a complete rip off of Chrono Trigger. Mega Man 2 music is more original than a lot of music on the radio today. Hopefully they put some stuff into a collector's edition. Capcom did some cool stuff for the SF IV CE a few years back and I know this is a game on a handheld system as opposed to home console but it does seem like a true RE so hopefully they bring something for the fans in NA and Europe. With all that in mind there are some amazing things happening there but nothing that can stand against freely made music by the same artists. If I'm going to play Zelda:SS for that many hours, do I really want to hear it's fantastic music on my headphones later in my day? It's made as part of an adventure, not for casual listening, and that would just drive me to hate it. Some people have the same ridiculous obsession with film music, usually because they haven't been exposed to enough real classical music that it was inspired by. Something will always be missing if you don't go to the source of music made for the sake of music. I believe that some game music could get there (I do have my favorites, the original "Boy and His Blob" theme, Mega Man, etc. ), but until then I'd rather just pop the game in to really hear the music as it was intended with the gameplay.